The Seas laboratory is located in the south end of the Seas building, resulting in a very little traffic noise, and as far away as possible from our mechanical production. We have an anechoic chamber, a reverberation room (used today as a storage room), a laboratory with lots of measurement systems, offices, listening room, and two meeting rooms. 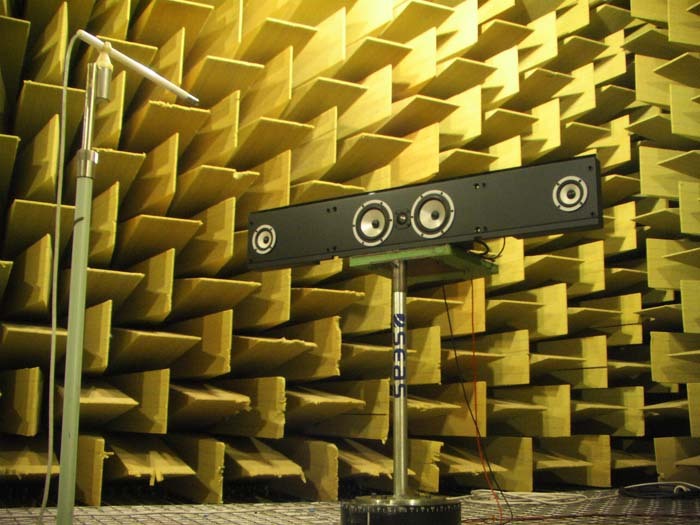 The anechoic chamber consists of a shell of concrete and Leca that rests on coil springs (16 x 3 ) to dampen noise from vibration in the ground. The mass (approx 200 tons) together with the springs results in a 2. order low pass filter with a cut off frequency of 2.5-3 Hz. The dimensions inside the shell is ( L x W x H ) 960 cm x 650 cm x 755 cm. All walls inside the anechoic chamber are covered with mineral wool wedges placed 5cm from the walls. These wedges together with the 5cm air layer represent an absorber/resonator which gives an absorption coefficient of more than 0.99 for frequencies above 70 Hz. The floor in the anechoic room is a net made from tensioned steel wires. The entrance into the room consists of two coupled steel doors which opens outwards, together with a 1m thick frame construction with wedges which open inwards. Loudspeakers, microphones etc. can be connected to the measuring equipment outside the room with a sophisticated cable system. The cables are led into the room through noise traps. A system of hooks from the roof and the floor gives us the possibility to mount different installations in different ways. The available room within the wedges above the wire floor is (Lx W x H): 750 cm x 440 cm x 480 cm. The room can be used for all kinds of free field measurements.